Description: This species has tall, feather like, upright colonies with unbranched main stems which bear straight side branches in rows on almost opposite sides of the top half of the stem. The colony is v-shaped in cross section, with the polyps all facing into the v. Several bract-like structures arise at regular intervals along the main stem. 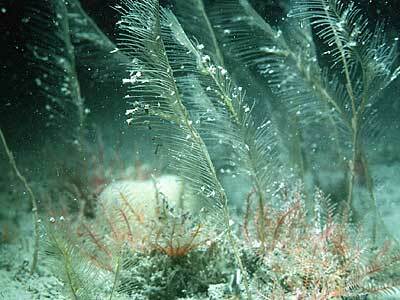 The reproductive polyps are borne on modified side branches, scattered at intervals up the colony. Groups of upright stems usually occur together, presumably joined by a basal stolon. Typically 30-40 cm in height, side branches 20mm. Habitat: Normally found in deep water, below 25 metres, in semi-sheltered sites with moderate tidal streams. Ecology: The worm-like caudofoveate mollusc Nematomenia banyulensis is frequently found coiled round the base of the stems of this species. Distribution: Very local, but found all round the British Isles. Frequent amongst islands in SW Scotland. Similar Species: A much larger hydroid than Gymnangium montagui or the Aglaophenia species found in the NE Atlantic. Bract-like structures on main stem. Reproductive polyps on modified side branches. Picton, B.E. & Morrow, C.C. (2016). Lytocarpia myriophyllum (Linnaeus, 1758). [In] Encyclopedia of Marine Life of Britain and Ireland.